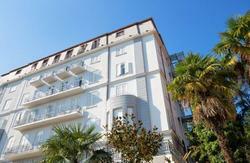 Hostel Link is newly opened (February 2014) one-and-only modern hostel on Opatija Riviera. Enjoy our hostel luxury, comfort modern facilities, positive atmosphere, quality food&drink, stunning sea view. Login to your perfect holiday! There is no possibility to check-out earlier or later due to reception business hours (07-23h). Animals/pets accepted: Pets up to 10kg/22 pounds allowed on request for 10â‚¬/day fee. Please contact hostel for further details. Hostel is located in the center of Lovran, a small town named after the plant - the laurel. Lovran has a long and rich tradition in tourism. Itâ€™s located on the eastern coast of Istria in the Kvarner Bay, situated at the foot of the greenest and richest mountain vegetation in the Adriatic - UÄka. Good climate, Mediterranean vegetation and favorable geographical position enabled the rapid development of tourism in the late 19th century. Road E61 to Croatia â€“ Basovizza â€“ Slovenian border â€“ Kozina â€“ Obrov â€“ Podgrad â€“ Croatian border â€“ Pasjak â€“ Rupa A7 highway to Rijeka â€“ direction â€œOpatijaâ€ â€“ exit â€œOpatija/Matuljiâ€ â€“ follow direction â€œOpatijaâ€ â€“ Opatija entrance â€“ roundabout (first exit on right side) â€“ pass through city of Opatija, and drive cca. 9km in â€œPulaâ€ direction â€“ entrance in Lovran â€“ turn left in sea direction, passing near gas station. Highway A1 â€œRijeka/Rekaâ€ â€“ exit Postojna (Slovenia) use the road No. 6 till the entrance in Croatia â€“ highway A7 â€“ direction â€œOpatijaâ€ â€“ exit â€œOpatija/Matuljiâ€ â€“ follow direction â€œOpatijaâ€ â€“ Opatija entrance â€“ roundabout (first exit on right side) â€“ pass through city of Opatija, and drive cca. 9km in â€œPulaâ€ direction â€“ entrance in Lovran â€“ turn left in sea direction, passing near gas station. Highway A1 in â€œRijeka/Splitâ€ direction â€“ in Bosiljevo turn to highway A6 in â€œRijekaâ€ direction till Rijeka (Grobnik) highway payment â€“ follow direction Pula â€“ turn right on exit to â€œPula/Pazin/Opatijaâ€ â€“ after cca. 20km tur turn to highway A8 â€“ use exit â€œOpatija/Matuljiâ€ â€“ Opatija entrance â€“ roundabout (first exit on right side) â€“ pass through city of Opatija, and drive cca. 9km in â€œPulaâ€ direction â€“ entrance in Lovran â€“ turn left in sea direction, passing near gas station. The nearest stations are in Matulji (12 km) and the city of Rijeka (21 km). From the main station to Lovran we suggest you use a bus or taxi. Nearest main station is in Rijeka (21 km) . Check the timetable on the pages of your transport company . direction to Opatija use bus line number 34 or 37 - in Opatija transfer to a bus in the direction to Lovran line number 32 - the hostel is located 200m from the central bus station in Lovran . Line number 32 - pass through Opatija and continue to Lovran - the hostel is located 200m from the central bus station in Lovran .